Throughout this course and this tutorial, I'm going to show you exactly how to get up and running with this amazing framework. There's a few things you're going to need before we begin. We will be using NPM (Node Package Manager) to install Electron, which requires Nodejs to be installed. If you're not sure if you have it installed, visit Nodejs.org and visit the downloads section. Download and run the appropriate installer based on your operating system, and follow through the guide with all of the default settings. Both of these commands should provide you with a version number. If so, you're ready to proceed to the next step! As mentioned earlier, we use NPM to install Electron. Note: The -y flag provides default options automatically. We have a few different installation options depending on our project. ..or, you can install it as a development dependency in your app, which is what we will do. When I say "bootstrapping", I mean, let's create the files necessary to get the most basic Electron App working as possible. Open up your code editor (I use Visual Studio Code) and open the new project folder we created. 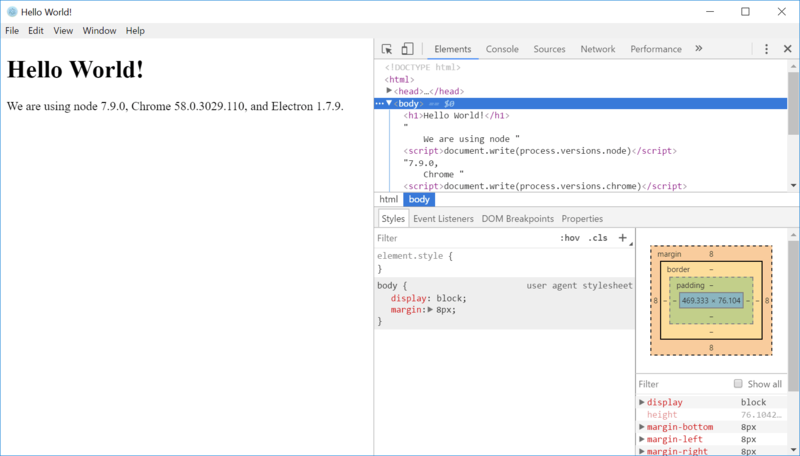 The scripts property will allow us to run npm start in the console to launch our Electron app, instead of writing electron . Let's take a look at the QuickStart Guide from the official Electron Documentation. First, we're defining a few necessary variables for both Electron, and working with file locations. let win as noted, is a global reference of the window object that will be created below. The createWindow() function helps define the actual application window that will be loaded once a user runs the application. This includes setting properties associated with the browser window via BrowserWindow, such as width, height and other properties that exist, as well as opening Dev Tools with .openDevTools(). This allows you to use a code and console inspector, similar to Chrome browsers. The final section simply sets win = null when the app has been closed. app.on('ready'.. calls the createWindow() function from above when the app is ready. window-all-closed calls app.quote() on non-mac operating systems. activate calls createWindow() if win is null. Ugly, huh? Don't worry, we will make it look a lot better shortly. In the next lesson, we're going to focus on Menus in Electron.